Base Knife: 52100 Complex High Carbon Steel blade, Handle material choice of various stabilized woods currently in stock, brass or nickel silver pins 1/8" or 1/4". Under 6" blade $225, over 6" blade $275. 52100 steel is a complex high carbon steel, it will form a beautiful patina over time and with use, yet has some Chrome in it to reduce staining. A gyuto in 52100 high carbon steel with Textured buffed forge finish with a natural blood wood handle. Two of our spear point hunters in 52100 high carbon steel in our shiny finish, both with black dyed spalted pecan. A honesuki in CPM154 stainless steel in our shiny finish with dyed and stabilized camel bone. A gyuto in CPM154 stainless steel with buffed forge finish with our lovely Blue dyed Spalted pecan handle. CPM154CM is a very high end, high carbon stainless steel. It is great for knives, takes and holds a great edge, good edge retention and good toughness. 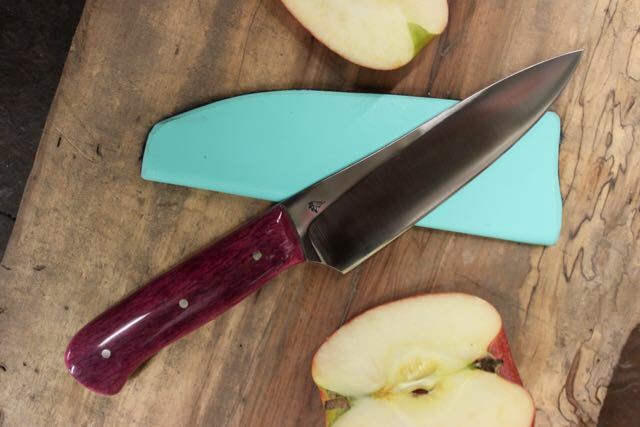 Its ease of maintenance makes it ideal for knives that get dirty and/or wet often. This is an excellent choice of steels for those who are not as consistent at washing knives after use. 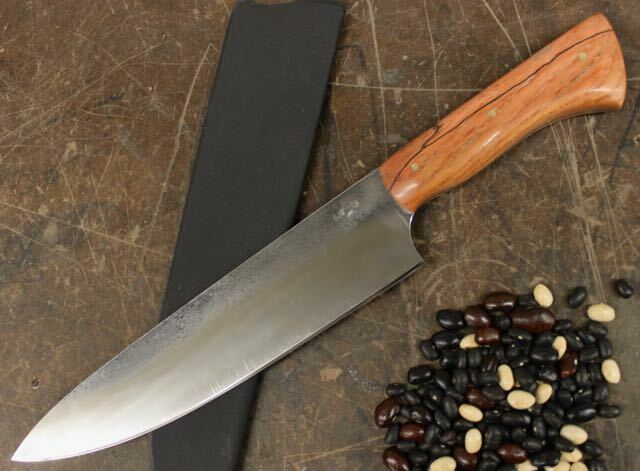 This steel adds $50 to small knives and $75 to large knives. 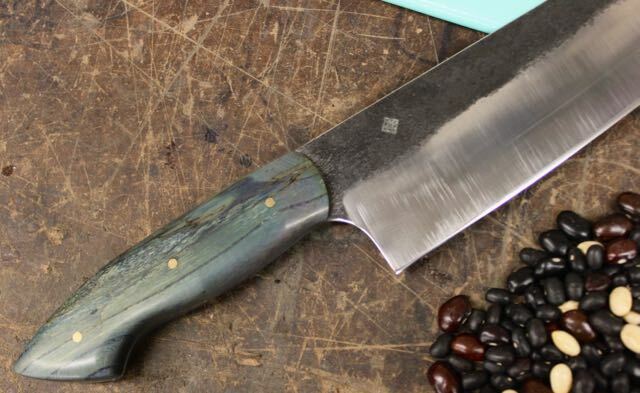 Our European Chef Knife in CPM154 stainless steel in our acid blast finish with our Blue spalted pecan handle material. A modified Gyuto Chef knife in CPM154 steel with our Buffed Forge finish with a red dyed and stabilized Spalted Pecan Handle. A Gyuto Chef knife with our Eli shaped handle in CPM154 steel with our Buffed Forge finish with a Bluedyed and stabilized Spalted Pecan Handle. A slender Gyuto in CPM154 stainless steel, with a polished forge finish with red/yellow box elder handle. Two clip point hunting knives in CPM154, both with 304 stainless bolsters, top has a brown stabilized camel bone handle, bottom is blue stabilized coral. A honesuki in CPM154 Stainless steel with our creative Acid wash, with a black oak handle. We currently use several types of handle material, watch our video below as we go through handle materials. Natural wood- Is dense or stable enough to not need stabilization. We now topically treat these woods with Birchwood Casey gun stock filler and oil. This is a set of steak knives done with East Asia blackwood. Resin Stabilized Materials- Wood, bone, antler etc. that has enough grain space to accept heated and sometimes colored resin. These include Maple, box elder, Mesquite, Black Ash Burl and other common burls and spalted woods (Pecan, Maple and Sugar Maple), and Camel Bone. I have stabilized woods in stock for my base knives as well as higher end more exotic woods, typically these wood handle cost $50. These are, by far, what a majority of our handles are made of. 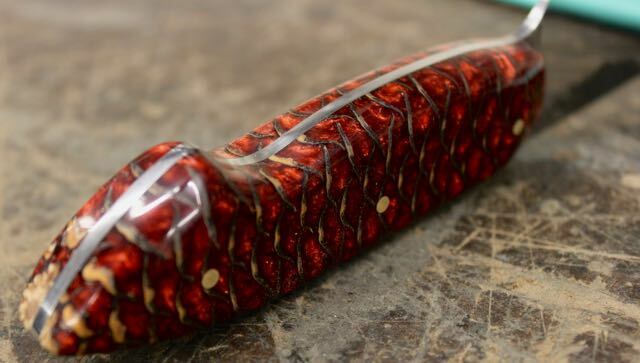 A resin stabilized pine cone handle. This comes in many colors and be scales out like this one, or with the core out. My newest style paring knife with a stabilized Mesquite handle. This handle was $45. A clip point hunter in Red camel bone. Depending on supply and quality these cost between $15 and $40. This is exotic dyed Resin Stabilized Giraffe bone, its cost is $100 per knife. Exotic Camel bone with Brass Pommel, 4 1/8" brass pins. 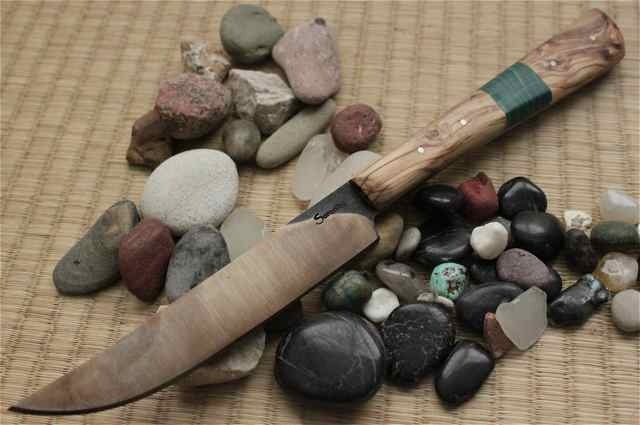 A gyuto with a wood bolster on a wood handle. 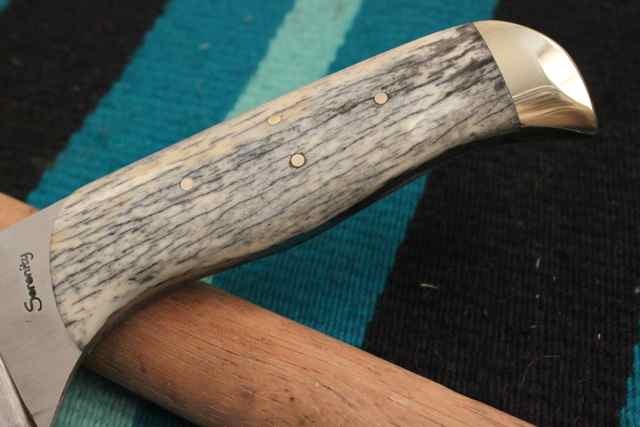 Brass Bolster with Amboyna Burl handle. 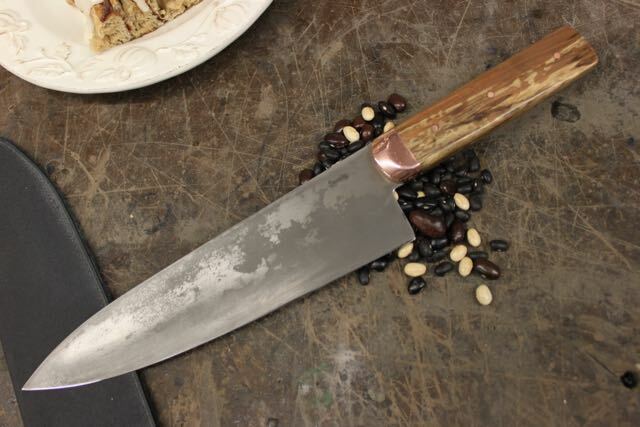 Copper bolster with Sugar maple handle, European Chef knife in CPM154 stainless steel in our creative acid wash finish. 304 Stainless steel Bolster and Pommel with Red curly maple handle, A hunter in CPM154 stainless Steel with our Acid Blast finish. This is now the only location I will use Malachite or Turquoise reconstituted stones. Slicer with Malachite interruption in Olive wood, 4 1/8" brass pins. Color Tempered 1084 steel blade. Mosaic Pins- Available in 1/8" and 1/4" many choices. $15 each. My newest interruption with the spacer material on either side of the malachite.